Brethren and visitors gathered at Cleveleys Masonic Hall to celebrate Ian Winnard being proclaimed as master of New Sanctuary Lodge No 6604 for a second year. 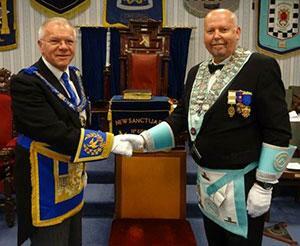 The lodge was honoured to receive Derek Parkinson Assistant Provincial Grand Master. Derek was accompanied by Tony Hough North Fylde Group Deputy Chairman, fellow grand officer Malcolm Worsley and was also accompanied by acting Provincial grand officers John Pitches, Gordon Smith and Deputy Provincial Grand Director of Ceremonies Jason Dell. Ian opened the lodge and showed the skill which has been an attribute of his first year as master by completing the early part of the business with alacrity, moving on to opening in the second degree. At this point the director of ceremonies retired, the lodge was then raised to the third degree and the lodge DC John Laughton returned to announce that Jason Dell sought admission. Jason duly announced the presence of Derek Parkinson who demanded admittance. Derek then entered in due form accompanied by grand and Provincial grand officers and was welcomed by Ian. John Laughton proclaimed Ian as master of the lodge for a second year. For the proclamation, John was ably assisted by installing senior and junior wardens Chris Williams and Philip Cole respectively, with Barry Seddon as inner guard, John was also aided by Alan Dean. The third degrees tools were delivered by Mark Tomlinson of Thornton and Cleveleys Lodge, with the second tools presented by Delwyn Hernen and finally the first degree tools delivered by Alan Dean. The address to the master was given by John Laughton with the master, Ian addressing the wardens. After completing the investment of the officers, John Pitches presented the address to the stewards which was followed by Derek Parkinson’s grand finale; his address to the brethren, bringing the proclamation ceremony to a memorable end. Picture left: John Darrell (left) toasts the new master during the master’s song. Picture right: Derek Parkinson (left) is presented with flowers to take back to his wife, Joan. The proceedings complete, Derek rose to bring the congratulations of Tony Harrison, Provincial Grand Master and wished that Ian and the brethren of the lodge would have a happy year and the health to enjoy it. Ian then presented Derek with cheques for £100 for the MCF 2021 Festival, £100 for Alzheimer’s Research UK, £100 for the Multiple Sclerosis Society and £100 for the 1st Thornton Cleveleys Scout Group. When added to other charity donations, given through Ian’s first year, this rose to a total of £1,266. Derek thanked the generosity of the lodge and its visitors. The brethren and guests were treated at the festive board to a sumptuous dinner that Cleveleys Masonic Hall is famous for. In the response to toast to the health of the grand officers Derek took the time to personally thank everyone who had taken part in the ceremony including John Laughton and Alan Dean and thanked Peter Dunn the group publicity officer for his hard work, John Pitches, Gordon Smith and Jason Dell for their support. Derek praised the brothers who had presented the working tools. He also spoke about the aims of the MCF 2021 Festival, advising the brethren that more money comes into West Lancashire each year from the MCF than goes out. Derek mentioned, as an example, the Papyrus charity based in our own area that has received £60,000 from the MCF to aid its work to prevent young suicides and detailed the money that has been donated to hospices throughout the Province. Derek also talked about the virtues of joining the Royal Arch which he described as a fulfilling degree. John Darrell’s rendition of the master’s song accompanied by Shaun Haynes was a high point of the festive board and to complete the evening a raffle raised the fantastic amount of £203; a great start to his second year for Ian. The Tyler’s toast ably delivered by Tom Egan which capped off what was a stunning installation.